Fantastic workshop! The instructor was friendly and helpful and I would definitely recommend this class to a friend. Really great teachers with design templates to chose from but also very happy to advise on freestyle designs. Was a bit of a rush to finish by the end of the class but anyone who didn’t finish were welcome to take what they needed home with them. It was very fun. The place was pretty and everybody was super nice and helpful. Best of all, I got a really cool "neon" sign out of it! Really cool workshop, I would never have done this by myself at home! The workshop itself was very enjoyable with a lovely instructor, and the finished piece looks great. Great workshop, the teacher was really friendly and knowledgeable. I went by myself and meet many really nice people who also came by themselves and it was their first time attending a crafting class just like me. I really enjoyed myself, I wish the class was a bit longer! Great workshop, great hosts/tutors. All materials provided, just need to turn up and then you get to take away some pretty glass. Use of the acid was easy. Absolutely fabulous ! I went with a friend and it was a great way to catch up and have fun. Rather than the same old dinner or drinks, this allowed us to be creative while chit chatting to one another like we would normally. Our lovely teacher gave us plenty of time to try different designs before having to commit to one design and encourage us to chat and enjoy ourselves. Definitely worth it !! It was incredibly fun, and the teachers were super friendly and helpful. The workshop was brilliant. Teacher fabulous and I thought really nice to have someone from LCC there as well. I can't wait to try everything I learnt. Only downside was the venue - lots of flies and not great light, which for embroidery is tricky with my slightly aging eyes. But I would go again! Amazing! The London Craft Club team was great! I was a total begginer and it was really easy to learn with them. Also, good vibes and energy! The class is so much fun, and the teacher is very nice. Eleanor was a great and very friendly workshop leader. Was a relaxed and supportive environment that brought together like minded people. Would definitely recommend. Really great fun, and lovely teachers! This is my second class with the London Craft Club and this time I went with my sister. 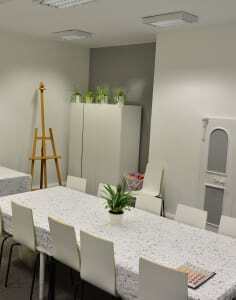 We had a great time, the teacher Shoshana was really nice, helpful and knowledgeable, she made the class really easy to follow and gave assistance when needed. I left feeling very excited of what I learnt. Really great class, clear instructions and lots of help and encouragement. The range of fabrics to choose from was great, hardest part was picking just two. Looking forward to the bag’s first night out, had lots of compliments already from those that have seen a photo of it. Had lots of fun and went home with my perfect clutch! It was a great workshop. Really well organised, good instructor and good amount of time. I would recommend it! Fantastic class, super friendly and funny teacher and she made me feel much more confident about my hand sewing skills. The general organisation of the workshop was spotless. We had a lovely glass of bubbly to give us a boost, and we all left with one or two super useful coin pockets - together with patterns for a great Xmas present gift idea.Highly recommended! Really enjoyed this class and so happy with the slippers I made! There was lots of options in terms of decorations and I was even able to change my mind about the color of the uppers that I had chosen beforehand. Location was really great too. Only downside was we were a bit rushed at the end in an attempt to finish the slippers there and then so a slightly longer class would have been better. I loved my natural dyeing class with London Craft Club! The teacher was clearly passionate about her craft and had loads of experience which she was very happy to share. She encouraged us to go away and experiment more at home in the future and shared a lot of info about how to create different shades. As there was some waiting around while the dyes took hold, there was a natural opportunity to chat to the other (friendly!) attendees, and it’s always nice to meet like-minded crafters. The session was quite expensive but for the knowledge I took away and the materials involved it was definitely good value for money. A friend and I attended the London Craft Club social in February at Saucer and Spritz, which is a cosy little café tucked away inside the Oasis store. We had a great time making paper beads - the guidance was clear and help was on hand when we had questions. Would recommend as a fun Saturday afternoon activity! Such a fun event - not much in London is free! Me and my friend had a great time and will be coming back to the next one too! The class was nice. We were guided through the steps and it was easy to get questions answered. The class was not long enough to finish the craft (which I would have preferred), but we were sent home with the supplies to finish the project at home. Venue was just a bit hard to find, but was nice. Teacher was good at explaining things.It would have been better if there were more variety of patterns to follow. It was really good fun. A bit fiddly to begin with but the two instructors were good at giving personalised advice on how to achieve our designs. Very good and helpful workshop great location, have informed friends and relatives as well as my artwork.Impressed by all. Thank you! Gorgeous teachers on a lovely course. I really enjoyed the workshop. It was more complicated than I expected, but nice to focus on something that required a lot of attention! Really pleased with the end result and although I didn't quite finish during the workshop it was easy to finish at home. I loved the class, clear instructions and the results were great! I am very happy with the London Craft Club, and it’s not the first time I came to their workshops. Again, so much fun! A great workshop, with a very knowledgable and helpful tutor. A fantastic workshop that was well worth the price. I started with an interest and left with a determination to use this skill in this years Christmas gifts! I loved the evening! It was very therapeutic, instruction was brief which was fab because it left time for cracking on with being creative!! We were all women which was quite nice and it was great to have the cafe facilities available! I felt that the course was happily generous in the provision of equipment etc! It was light hearted and fun!! Fantastic class. Clear instructions, good equipment and enough time to really get into it. Well run and clear instructions at the class. Maddie was super helpful and it was nice to bring a finished product soon and to be able to take the skills home to be used again. As always London Craft Club fulfils all promises; you get an instruction sheet, a kit and a nice lady to oversee what you are doing throughout the course! I feel confident with picking up the needle punch in my own now, thanks! London Craft Club workshops are so much fun. The teachers are informative and encouraging, the LCC rep is always friendly and the atmosphere is just brimming with creative potential! This is the first time I have booked an Obby workshop and went along with a friend. I would highly recommend trying one of these workshops, we had a great time. Amber was a very good teacher, she made all the instructions clear and showed examples of each stage where needed so it was easy to visualise what needed to be done at each step. The surroundings were lovely, a gift and coffee shop and the atmosphere good. Attendees could work at their own pace, which suited me. I came away with my own book which I had made from scratch and feel confident that I could make one again myself. As an added bonus we were given a little kit of tools to use. I will definitely be on the look out for some more courses to try out. One happy customer. Absolutely fantastic! I've done a class with Amber before and she is a fabulous tutor. Really loved the venue and a glass on prosecco went down a treat. I'm going to Japan for a holiday in April and will now be bringing back a ton of paper... I'll be back for more! This class was fantastic, I'd already done "bookbinding for beginners" with Amber and I enjoyed so much I decided to join another class. Amber is a very good teacher, she gives clear instructions, and adapts to the pace of students. Such a great class! Easy step by step instructions and a lot of help with our book making! I managed to finish my book at home, and the end result is beautiful! I enjoyed it a lot! I could not attend the workshop as I was diagnosed with the flu the day beforehand. I kindly informed the workshop organisers (which I didn’t have to go out of my way to do), and didn’t even ask for a refund I only asked if I could reschedule instead of infecting everyone with my illness, or for some sort of credit until I was healthy again. But I was declined and they still kept every penny of my money only offering a discount code for another booking. I also did not receive the starter kit which was included in the price I paid. Why haven’t I got this? This policy needs to be reviewed as I will not be booking a workshop again where such little compassion is shown for a customer. Really terrible treatment. I really enjoyed this course, the tuition and the materials were great and I left with a real interest in taking this craft further. My only issue was that there was not quite enough time, which meant we were rushing rather at the end. Other than that, very enjoyable and highly recommended. Valentina was a friendly, helpful host...nicely set up workshop with lots of choices of leather to make jewellery from :o).Only tools for design/similar advertised...was a bit disappointed as there was no painting as advertised, which I was looking forward to! Shoshy Cadoodle made Master Brush Lettering a really fun, accessible class, and her individual tuition as we concentrated on our brush strokes was very useful. My niece and I had a fabulous evening together, creating something we can keep. Huge thanks to Penny for her support and approachability! Really enjoyed the workshop. Lovely atmosphere and great people running it. More advice for left handed writing would have been welcome. Fab venue, super convenient location. Great teacher, fun night and met some lovely ladies! Will look forward to seeing some of them at the next workshops I’ve booked. Really fun class in a lovely venue - definitely a skill that I will keep practicing at home! Really fun class, shoshy was very patient and made the brushstrokes look really easy! I came away after having a fun evening with a nice little piece of art. Such a fun event and we got to take the ink and brush home so we can practice. I attended the London Craft Club's BIG lampshade course at Todd Sloane in Epping. The class was excellent; the teacher was very friendly, the venue was perfect and I had the lampshade up in my hallway as soon as I got home after the class. I really enjoyed this workshop. The organisers were friendly and attentive throughout always on hand to give handy tips and tricks to make your pom-pom animal better. The evening seemed to fly by. I left with unfinished pom pom's but I am confident I can carry on at home. Great workshop and a must do for anyone with a love for all things cute. I really enjoyed my evening of pompom making. I loved that all the materials were provided and that I got to keep my pom maker so I can continue to try and making amazing pompoms at home! The class hosts were very welcoming and friendly. Unfortunately I was massively late due to cancelled trains and tubes, but I was still made to feel welcome instead of a nuisance. I was soon up to speed thanks to the lovely tutors, and still managed to make a cute bunny Pom Pom. I love the Pom Pom maker we got to take home, it's great quality, beautiful , not plastic (hurrah!) and I can't wait to use it again. Beautiful venue , friendly staff and nice and warm on a very cold night! Lovely workshop as usual from LCC. Great to get the pom maker and a felting needle to take home. Maybe need to spend a bit less time on the practice pompom ? maybe work in pairs, as always nice to go home with a finished article. I need to find some sharp enough scissors to finish trimming my bunny! How cute can a Pom Pom be? An absolutely great workshop, thoroughly enjoyable with a fab result that you can create at home too. Such a lovely place for the class, cute topic, friendly teachers:) one more hour would make learning easier. I had a nice evening and although the teacher was supportive I felt i was simply reading the material from the leaflet provided. The best thing was the pom maker you get to take home. My cousin and I had a great time at the pompom making workshop. It was so fun and was so rewarding after completing the pompom. The only downside is that we were given an instruction booklet but it would have been better if the teachers had remonstrated it instead, and just given the booklet as a take home. The workshop was really fun. Great for beginners and very friendly. The ladies were super helpful and knowledgeable which put our group's minds at ease. They used brilliant demonstration aids and the workshop was great fun throughout. Would highly recommend to anyone with an interest in embroidery. Really great introduction to embroidery. I had never done it before, and the tutor Eleanor was really encouraging. You also get to take away some threads to finish it off at home! Really fantastic workshop Eleanor was such a great teacher very patient and generous with her knowledge. We were all encouraged to use our imaginations. I will definitely continue to embroider. I had great fun doing the opulent velvet clutch bag workshop. The tut tore were super friendly and very helpful. I would definitely do another workshop with the London Craft Club 😃. Very helpful and encouraging teachers. Bits along the way were a little fiddly and I was sure it wasn't going to turn out well - but all of a sudden I put things together and ended up with a beautiful bag! Loved it!! Teachers were friendly, helpful and explained everything fully. They also cleared up around us, so we had a decent work area. I am super happy with my clutchbag, and cant wait to use it. Highly recommend this workshop, Cant wait to get booking some more!! Thanks for a fab sat!! The class was good fun. I was really pleased with how my clutch came out and found the whole thing a lot easier than I'd expected. We were provided with directions and all the materials we needed. However, it was quite a big group so the trainers walked from table to table instead of giving instructions to the room. Unfortunately the others at my table went much faster than me, so the instructions were given well before I was ready. This mean the people on my table generally gave me instructions rather than the trainers themselves. Additionally, the last part of making the clutch was the option of embellishing with some iron-on glitter paper; by the time I was ready to use the glitter paper only unsuitable colours remained, so I wasn't able to add any embellishments. Great intro to calligraphy in a fun, relaxed atmosphere. The girls running the event were very knowledgeable and happy to help with anything. Brilliant set to takeaway and continue practising - would definitely recommend. I had a thoroughly enjoyable afternoon which went far too quickly. We were all absorbed in making our bags and were impressed at how professional they looked and the. Variety of designs achieved. This class was very enjoyable. The surroundings were warm and welcoming as was the teacher. The instructions were clear and simple to follow and having someone there to help gave me confidence i was doing it right! I definitely would like to try some of their other classes. Such a great selection of fabrics, brilliant teacher, and love my finished clutch bag! A wonderful evening of gorgeous crafts. I love the clutch I made and I’m so pleased it turned out so well. Thank you for all the help!! Unfortunately I was very disappointed in this class. Although the teacher was friendly she not demonstrate any techniques and introduced the class by saying 'there wouldnt really be any teaching'. We started almost 45 minutes late and the venue was filthy and run down. A real let down. Excellent class, had a wonderful time and learned a new skill. Will be coming back soon. Sonia was very welcoming and was a very good host. She was really helpful in giving us tips as to how to handle the heat tool and the different tips/nibs that we could use to make different shapes and effects on the wood. There were lots of opportunities to try out different techniques and we had a piece of wood on which we could try out various styles and nibs.Sonia also told us how we can continue pyrography at home: what type of heat tool we could purchase and where to get the different bits of chopping board, spatulas or little wooden shapes for decoration.The class size was good - there were 9 of us at the time, and it was a good number for the size of the room. 3 hours also seemed a good amount of time for the workshop. A lot of us got to decorate most of the wooden items that we got (if not all of them). There was enough time to take breaks without feeling like you need to rush to get everything done.Lastly, I mustn't forget to mention that it was a nice touch to have prosecco or cups of tea for those who wanted it! Just great, what a lovely way to relax after a hard week. It’s a great craft and whether you are going to try it just once or take it up full time after this it’s a brilliant experience. Feel grown up and creative using the specialised tools and have fun making a whole range of products! Real value for money (I enjoyed myself and made a bunch of presents). An excellent, friendly instructor who is welcoming and informative. I so recommend this - go burn stuff! really lovely class with friendly in informative instructors. This is THE most hospitable art/craft course I've ever done (and I've done a few). Our tutors were super friendly and very experienced. They had a great balance for teaching us as individuals as well as a whole group. The number & variety of wooden items we got to work on (and take home) was extremely generous. Equally Amber readily shared loads of info about continuing a pyrography practice ourselves (and did not couch this in more courses!). I felt hugely inspired and informed by this beginner course to easily continue this craft on my own. There are so few pyrography courses out there I don't hesitate to say this is one of the best! I had the best time at this class! It was well instructed and a great group of people. I love the process of Pyrography and was great to learn it in a class. Can't wait to continue with projects at home. Friendly, helpful and enthusiastic teacher, excellent venue and location, and a project that once shown could be done at home - if I can make some time. Loved the workshop, it was great to come away with a finished product. Only issue was that the venue was very cold. I really enjoyed the class itself, it was fun and I came away having learned a new Craft and a piece I’d made which gave me instant gratification; I can see it becoming addictive. However, I think the venue was bizarrely located it took me a while to find it, it was pretty cold in there and I didn’t feel particularly safe walking back to the overground from there. So much fun! Cannot wait to make more stuff with my new skills! Great range of wools available and you make a scarf in one evening. Great instruction from Sonia and good central London location. Have had admiring comments from friends for my scarf! The workshop was very festive and was held in a lovely location. Hannah was really welcoming and it was great to learn some new paper crafting skills. Would definitely recommend London Craft Club workshops to others. Had a fun and productive evening. The class was great as everyone worked on what interested them. The instructor was very knowledgable and enjoyed what she was doing. It was also great how the instructor wasn’t stingy with the supplies. Feel inspired! Lovely class and teacher at the Festive Hoop Art class. I finished 1 hoop on the night, half started another one and left with the materials to complete another hoop at home. I learnt brand new skills and I think this is the start of a new craft addiction! A fab session at the museum of London. Small class so lots of help from teacher Chris, who gave loads of tips to make hand quilting easier. Techniques learnt by making a mini quilt and there's been no stopping me since! I have transferred what I learned to larger quilts and even cushion covers. Thanks London craft club. A fun and chilled out atmosphere with the added bonus of refining my hand sewing skills whilst catching up with friends! The venue was lovely and teacher lead the session well. Able to answer questions and advise accordingly. Really enjoyed this experience. Had so much fun creating my first lampshade. Location was lovely, perfect class size and instructor was great! Easy to follow and guide you through each step! Interesting class - there was a focus on learning skills to be able to repeat the process at home, which was great. At certain points in the process it demands a lot of the instructor's time so there's a bit of waiting, but overall I found it interesting and would recommend it as a good evening. Funky venue, lovely teacher and a huge amount of fun. Left with some beautiful jewellery too. The instructor was so kind and patient! Excellent session with a very friendly and helpful instructor. The materials provided were of a high quality. Was impressed by what I managed to achieve and will be using the generous supplies I was sent home to make some more Crackers. Thank you. We had someone come into our office to teach us how to make Crackers, she was knowledgeable, helpful and really nice.